The word improvisation can be a little daunting. It conjures images of virtuosos that can play the ukulele in the dark with their hands tied behind their backs (well, sort of but you get what I mean). It doesn’t need to be that difficult though, and really, it isn’t. You only need 6 notes. That’s right, just 6 to get freestyling with a bit of blues soloing. In the example above I’m just playing through the scale so you can hear the notes. If we use a little creative spacing between those notes then you get something like the below. I’m still playing the scale in a linear fashion which is quite restrictive but it does give you a flavour of what you can do with it. Here I’m not going crazy but I am playing around with that scale a little further and jumping around a little bit. One thing I really like to do is fire up a backing track and play around with the scale over the top. Here’s a good one to have a go with. That’s all great, but we’re not always wanting to play in C. So how do we play the blues scale in another key? Simple by sliding it around your fretboard. The root note in the C blues scale above is the open C string (root note is the scale key). 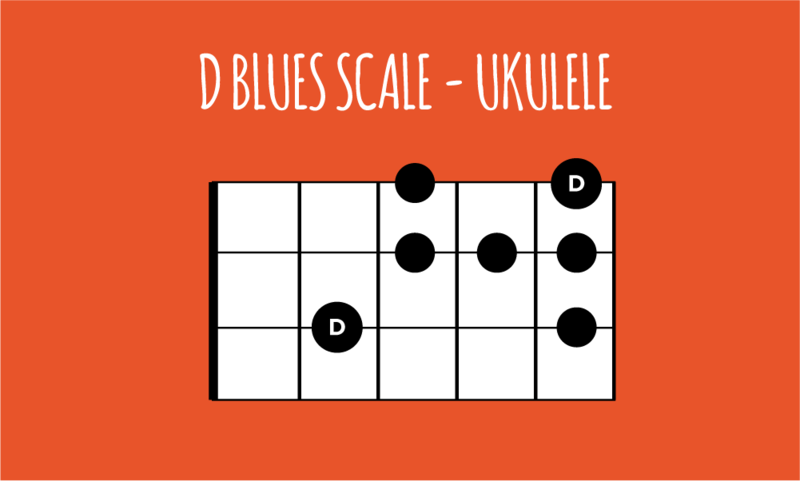 If we slide that whole scale up 2 frets, we now have a D blues scale. Notice that it’s exactly the same as the C blues scale we looked at above, only it’s further up the fretboard. Have a listen to the D blues scale below. Slide it up another 2 frets and we have an E blues scale (and so on and so on). Once you get this pattern locked down, with a little fretboard knowledge you’ll be able to play the blues scale in any key. Have a play around with it and experiment. Give the backing track above a try or have a friend play a 12 bar blues for you to play over the top. You can let each other have a turn at soloing over the top. It’s loads of fun. If you just can’t get enough playing the blues then I’d highly recommend Al Wood’s How To Play Blues Ukulele ebook. 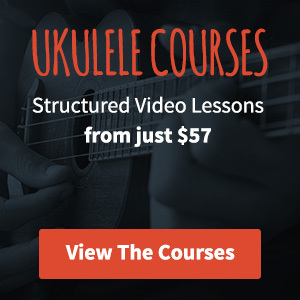 At just $17 it’s the best blues ukulele book out there and it will definitely turn you into a better blues man (or woman). That’s pretty cool. 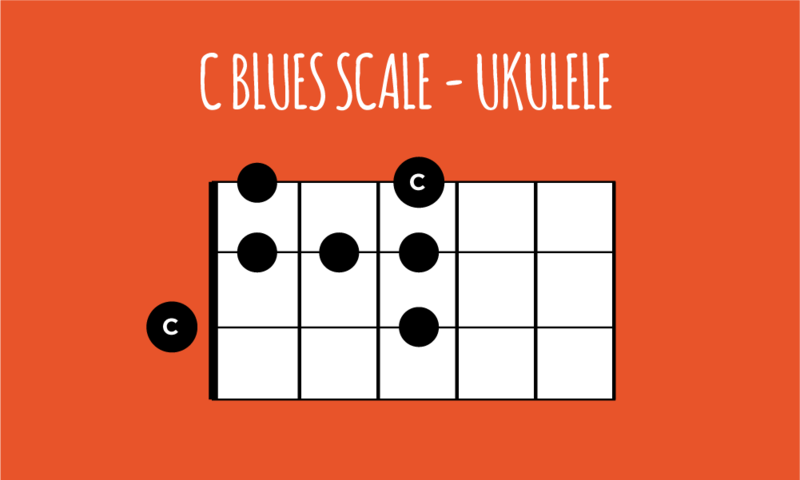 I learned blues scales ages ago on guitar, but never got around to learning it on uke. Thanks for forcing my hand! I’m amazed how easy it is to play along with the backing track. Fun! It’s loads of fun isn’t it? That’s a a great and simple explanation thanks Dave, and yes, I’ve purchased Al Woods How to Play Blues book. It’s brilliant and excellent value. There’s some generous souls out there in the ukulele community. Would you consider doing a lesson on how to jam with a group? I was invited to do that, they said the jam session would be in the key of C and G. I’m not really sure what that means or how it goes, would be great to learn. By the way, the link on your contact section is broke. Thanks Ally, that should be all fixed now. Yeah I’ll definitely add that to my list of topics to cover, it’s a good one I think!